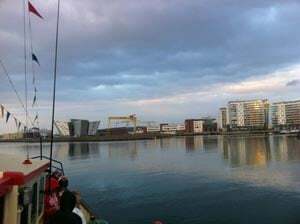 As a long time Titanic enthusiast, I had always planned to spend the 2 April 2012 in Belfast to commemorate the Titanic’s departure from the place of her birth with friends from the Belfast Titanic Society. It was just a happy co-incidence that 31 March was the opening day of the building I’d heard referred to on previous trips as the “Titanic Signature Project” and the Belfast Titanic Society had decided to hold its annual dinner in the building. It was with no particular expectation that I booked tickets in January for the dinner and tour of the exhibition at ‘Titanic Belfast’ as the building is now called. When I arrived in Belfast on Saturday 31 March, it was clear that I was in a very privileged position to be among the building’s first visitors. There was saturation coverage on the local radio and when I arrived at the building, there were huge crowds with TV cameras and reporters intermingling with tourists who had come out on the sunny but chilly day by the River Lagan. I was immediately struck by how the old Harland & Wolff shipyard had changed since I first saw it in 2001. Then, it was not much more than a collection of abandoned buildings in an area that was almost completely deserted and symbolised Northern Ireland’s industrial past. Today, there is an eye-catching modernist building fashioned to symbolise a ship’s bow upon which it is hoped a future of prosperous tourism will be built and the project will break even on the £100 million investment that was needed to make it possible. From the large crowds in the first few days after opening, it appears the exhibition has certainly got off to a prosperous start. A visit to Titanic Belfast may start with visits to the Titanic shop and one of the two food outlets on the ground floor: ‘Bistro 401’ and ‘The Galley’. The shop stocks a wide range of books on the Titanic and contemporary memorabilia in the form of T-Shirts, mugs, pens, ornaments, art prints and other souvenirs. It is a megastore of Titanic merchandise and sets the ‘theme park’ tone of the attraction. The food and drink at the two eateries was standard modern fare and there was no discernible Titanic connection with the food that was on offer or with the decoration. Bistro 401 has plain white tiles and food served on blue Chinese influenced plates giving a rather cold feel to the place. I wondered why the opportunity had not been taken to theme Bistro 401 on the Dining Saloons or the A La Carte Restaurant and ‘The Galley’ on the Café Parisien. What connected the three retail outlets on the Ground Floor was their Titanic prices: a T-Shirt in the shop cost £16 and a single empire biscuit in Bistro 401 cost almost £2. The service in the retail outlets was also very slow as it appeared the staff were inexperienced at dealing with large crowds. The prices and organisation may leave you hoping that the £13.50 fee for the exhibition offers real value for money. In order to get the full experience of the exhibition, I paid an extra £3 to get the audio guide to take me around the nine galleries that tell the Titanic story from Belfast’s perspective so inevitably, a great deal of emphasis is placed on Titanic’s design and construction. To begin with, you walk through two galleries that tell the story of Belfast’s industrial history as “linenopolis” and the history of shipbuilding before taking you into mock ups of the Drawing Offices and the Arrol Gantry. Once you get to the top of the lift, a guide enthusiastically invites you to look over the railing and think of how the height you are at is less than half of which the shipyard’s workers would have to endure on a daily basis and they would have three planks to walk on rather than the ten laid out for you, the visitor. If the retail outlets on the ground floor were not enough to convince you that the attraction has a theme park feel to it, there is a ride on ski-lift style carriages that gives you a tour with commentary of a rendition of the shipyard as Titanic was being built. I found that what was being described did not necessarily tally with what you saw in front of you apart from the centre propeller bracket and the pub windows with the shows of workers celebrating Titanic’s launch. I doubt that all Harland & Wolff employees would like to have spent a weekend night in a pub and there is scope to tell more about the domestic life and dangers faced by ship yard workers who occupied the red brick terrace housing not far away from the building. As you’re now high up in the building, the exhibition’s designers take advantage of the slipways just outside to show some footage of Olympic’s launch day in front of some windows offering a panoramic view of the slipways which dissolve into a rendition of the Arrol Gantry with Titanic on the stocks. The rendition is not perhaps all that convincing but the view of the slipways, showing exactly how big Titanic and Olympic were, certainly is. 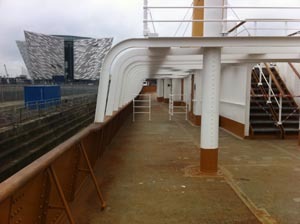 The outlines of the keels are lit up in blue at night and on the Titanic slipway, a deck plan of the Boat Deck is etched into the concrete. The Arrol Gantry is represented by vertical iron beams which are also illuminated at night which make for a spectacular addition to the Belfast skyline. The next gallery deals with Titanic’s fitting out which shows a unique model illustrating the state Titanic was in when she was launched and when she was completed bringing home to you to the contrast. 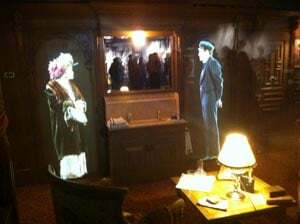 There are mock ups of staterooms from all three classes with holograms of the type of people you may find in them. 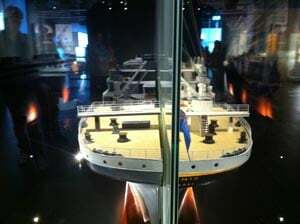 There is a surround display of a computer rendition of the Titanic from the Orlop Deck to the Wheelhouse which lasts about four minutes and was a very popular attraction and aptly complemented the detailed descriptions of the rooms and samples of the materials that were used in making them. Next, you are brought on to consider the maiden voyage, emphasis being placed on the provisions that were loaded aboard at Southampton with interactive games and computer graphics to tell you their gargantuan proportions. There is a narrative of Titanic’s stops at Cherbourg and Queenstown. The sinking is then dealt with in only one room which follows a passage which is lined by Morse code streaming in lights along the wall. An animation of the sinking is shown on a huge screen, there is a display about the Carpathia’s rescue and there is a wall covered in plastic lifejackets. As the mantra of the Belfast Titanic Society is: “what happened to the Titanic was a disaster but she was not”; it is perhaps unsurprising that relatively little emphasis is put onto the sinking. The grand finale of the exhibition is the ‘Discovery Theatre’ which puts footage of the wreck up on a gigantic screen for you to sit and watch before you go down to the glass floor which emulates Robert Ballards first pass over the wreck in 1985. Ballard had a prominent hand in the design of Titanic Belfast and he was invited to write the foreword in which he makes the surprising revelation that prior to coming to Belfast, he did not know about the Harland & Wolff guarantee group that was led by Thomas Andrews! The rendition of the Grand Staircase on the top floor of the building has attracted publicity for the new attraction but is not part of the tour. As a concession, it has been made available on select Sundays. I managed to see it during the Belfast Titanic Society’s 2nd April Dinner and I can say that while it is an impressive addition to a large function room it is disappointing as a representation of Titanic’s interior. Aside from the brass handrails added to the middle of the steps and to the banisters for “health and safety”, the detail of the wood and ironwork was noticeably different from the actual grand staircase of the Olympic seen at the White Swan Hotel in Alnwick and the remnants of Titanic’s aft grand staircase photographed on the sea bed. The unconvincing shallow, circular dome lit in purple capped the disappointment off. When I asked why a true rendition had not been attempted, I was informed by a member of the Belfast Titanic Society that the building is intended to interpret the Titanic and not replicate it. All the same, with the money invested in the building, I cannot see why just a little more attention to detail could not have been used to produce a replica of the grand staircase that would make you feel truly as if you were on the Titanic as has been done successfully at Titanic attractions in the USA. While the Grand staircase is not authentic, nearby in the Alexander Dry Dock is Nomadic which has had huge progress in her restoration in recent months. She now looks more or less as she did in 1911 on the outside and the refitting of her interior by the Nomadic Charitable Trust is progressing well and it is hoped that she will be finished by next year. If you do visit Titanic Belfast, Nomadic is also a must see attraction that is truly original and authentic and was built in the style of Olympic and Titanic by the same workers who created the great ships. 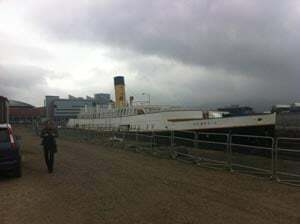 It is certainly true that in its first two weeks, the Titanic Belfast attraction has been hugely successful. 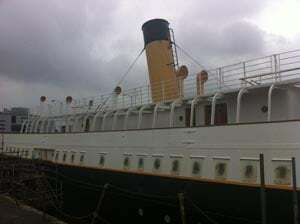 Whether that success will continue beyond the first few years after Titanic’s centenary is yet to be seen. I left with a good feeling and felt, as someone with a lifelong interest in the Titanic and ocean liners, that the trip to Belfast to see the attraction was very worthwhile and the staff were very hospitable and welcoming. The local press were ecstatic in their reviews and certainly the attraction will be very informative to those who, unlike myself, only have a passing interest in the subject. 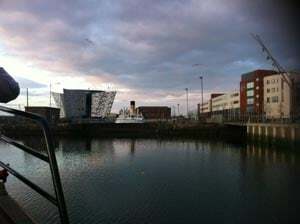 Titanic Belfast will indeed be an attraction for the city and Northern Ireland to be proud of. Stuart Kelly has been a member of the ET messageboard since 2001 and is webmaster of rmsolympic.org, a site about the surviving relics of the Olympic.